In my 25 years of selling, I always had to be creative with client proposals to keep me at the top of my game. I never assumed I had the sale, even with my repeat, loyal, dedicated customers. I kept my edge by consistent follow up, being aware of what my competitors were doing and always, always, being ready to answer any question to help the client make a decision. Proposals were always sent in the budget provided, but more often than not, budget was never the issue in the client making that decision. It always came down to defining myself as the best solution-driven catering salesperson for their event. I let them know I could fix any challenge or problem on-site based on my experience. I made the clients feel that they had to do their event with me. That I was part of their team. Catering is a scary purchase for clients, especially first time buyers. Imagine being a bride and groom. The investment in a wedding is equal to purchasing a car. They feel anxious, nervous and excited, yet do not want to show their vulnerability when it comes spending the money. When a salesperson can ease that anxiety by showing they are there to solve any challenge, it develops a level of trust and partnership. Explaining the potential problems and “pitfalls” will ease their minds. Being proactive in these conversations let’s them know you have dealt with their fears before and you have a solution. At the end of the day, clients hire you out of “fear” of not hiring you! Be this solution-driven salesperson and figure out how to get your message across to your potential clients. Have your toolbox prepared to show them your stuff. Always be ready to answer their questions and be creative with your solutions. You will win the business more often than not with this approach. I was out for my daily walk and decided to end it with a freshly squeezed orange juice. On street corners in Mexican cities, it is very common to see vendors working at metal carts and stands offering freshly made to order foods and beverages. A specialty cart near my condo was lined with oranges, grapefruits, herbs and vegetables with a woman making fabulous juices and smoothies. 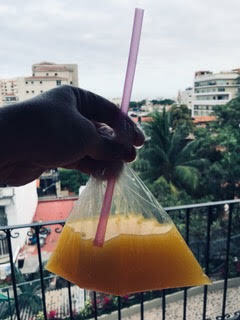 I wanted to bring home a simple “jugo de naranja” … orange juice. She cut the oranges, squeezed them freshly in front of me then poured the juice to the rim in a plastic cup. As I was about four blocks from my place, I asked her for a lid. “Lo siento”. No lids. Bummer, I didn’t want to spill on my clothes. I guess I’d just have to stand there and drink it, but I really wanted it with my toast and coffee in my condo. No hay problema. She asked if I wanted a “bolsa”. “Si”. I was curious what she was going to do. She poured the juice into a thin plastic bag. Put a hot pink straw in and twisted it in a knot. ¡Hurra! The sale was made and I was happy. I walked home and did not spill a drop. She made a creative solution and had me as a return customer every day for the rest of the month.